Gage Gay made the drive to the Atlantic City Invitational from his home in Staley, North Carolina. Photo: instagram.com/gage_gay94. ATLANTIC CITY, N.J. – Gage Gay is no stranger to hurricanes. Gay can remember growing up in Florida and hunkering down during hurricane season prior to moving to Staley, North Carolina, when he was 12 years old. “I have been sitting in my house before listening to the tin peeling off the roof,” Gay recalled. The 24-year-old understands the severity and danger factors that come with any hurricane, and his thoughts and prayers are with all of those currently affected by Hurricane Florence in the Carolinas this weekend. The North Carolina resident made the 500-mile drive north to New Jersey for this weekend’s Atlantic City Invitational and said that he was able to escape the bulk of the storm in time. Gay lives about 4 hours from the coast, but he wanted to make sure he played it safe and parked his boat and truck in the middle of a field so that no trees could fall on them. Gay believes his part of the state will get about five to eight inches of rain. 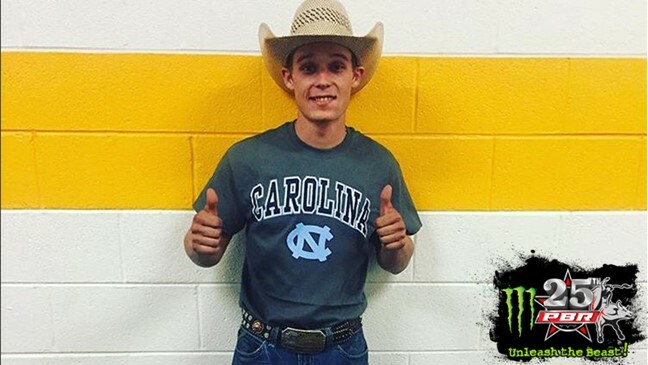 Meanwhile, two-time World Champion J.B. Mauney lives about an hour and a half west of Gay in Statesville, North Carolina. Mauney left for Atlantic City about two hours before Gay did, and he too escaped the brunt of the storm as well. The PBR gave out 180 tickets this weekend to evacuees that are riding out the storm in Atlantic City. Inside the arena, Gay was bucked off by Copperhead Road in 7.6 seconds during Round 1. Gay revealed before the event that he will need to get an MRI on his right knee this week after spraining it in the practice pen on Thursday. He missed over six months earlier this year after he tore his ACL and MCL a week after winning the season-opening Monster Energy Buck Off at the Garden. Mauney finished in a three-way tie for second place courtesy of his 87.25-point ride on Hot Rod. The 31-year-old earned 50 world points to move back into the Top 35 of the world standings. Mauney heads into his Round 2 matchup against Blow Hole (0-0, PBR UTB) ranked 32nd in the world standings. He leads No. 35 Marcos Gloria by 21.66 points.